In terms of culture, Lombok Island is famous for its tribe called Sasak. However, travelers need also to explore other charms of the island, including the presence of a renowned hot spring called Aik Kalak Pengkereman Jembangan. Aik Kalak means “Air Mendidih” or boiling water, actually. As the name suggests, it is the place where tourists can enjoy bathing in comfortable warm water surrounded by nature. Aside from bathing, people come to the site to do other activities including learning the history of the site and perform a ritual (usually done by the locals). Like other hot springs, Aik Kalak Pengkereman Jembangan is located in an open area. What makes it different is that it resides on the highland so the nuance becomes both cold and warm at the same time. The refreshing atmosphere of Rinjani Mountain and warm water of the hot spring would soothe everyone, for sure. Many stones reside on the pond, as well. They, somehow, become the best place to rest and sit during bathing. Visitors also use the stones to put their clothes and other belongings. It is, without a doubt, the hot spring is popular for its soothing warm water. No wonder, almost all visitors want to get in the water and take a bath there. It is not a problem to spend an hour or two in the water, after all. Another interesting fact is that such comforting water is able to eradicate stresses and rejuvenate energy. The locals even believe it is able to overcome some diseases like stroke, high blood pressure, skin issues, etc. The next interesting thing regarding the hot spring is the history. Tourists are able to obtain some information about the past of this site from both the locals and guides, after all. It is said Aik Kalak Pengkereman Jembangan Hot Spring once became Jayanegara’s favorite place to take a bath. He was a famous and influencing person back then. Still, no one knows detailed information about him and his fondness of the hot spring. Some people, though, think that Jayanegara took advantage of the pond to nurture his power and wisdom. Another thing that tourists should know about Aik Kalak Pengkereman Jembangan Hot Spring is the fact that the villagers often come to the site to wash their holy items like keris, swords, etc. As mentioned before, the locals consider the hot spring to be sacred and magical. As for tourists, they can witness such procession as long as they come at the right time. Taking pictures is even allowed during the event! 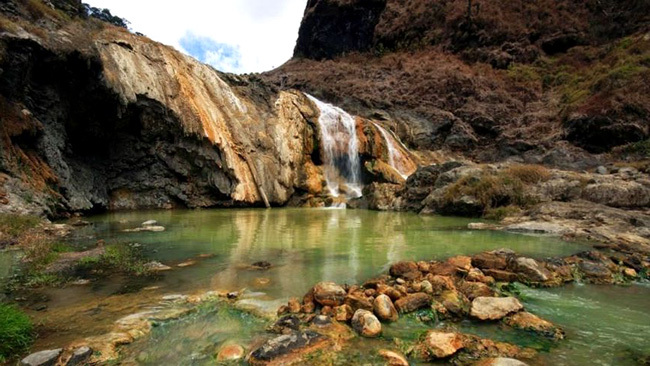 The best checkpoint to get to Aik Kalak Pengkereman Jembangan Hot Spring is Sembalun Village. In this case, the trip takes about 3 hours if travelers come from the capital of Lombok – Mataram City. The distance is 99.1 km, actually. Also, they need to take Raya Mataram – Labuan Lombok Street for a faster trip.